The previous night I had overindulged in a delicious buffet. At night, I experienced excruciating pain in my stomach. I was curled up like a snail in its shell. As tempting as it was, that session of overeating had given me an upset stomach and a very bad heartburn. In my effort to find a cure to my agony, I recalled the saying: Prevention is Better than Cure. Through my research, I learnt how bigger meals require more acid to digest the food which in turn increases one’s chances of getting heartburn or indigestion. That wasn't the first time I experienced such pain. I have very bad eating habits. Eating late in the day, eating on the run, overeating, drinking not enough water and skipping meals are regular occurrences. Consequently, I am troubled with indigestion and heartburn. I can easily blame my busy lifestyle for developing such habits, But then, I believe the type of food consumed plays an important role as well. For instance, eating plenty of fibre every day is considered extremely important to keep indigestion at bay. There are various other habits and "foods" that one should consume to keep their digestive system healthy. 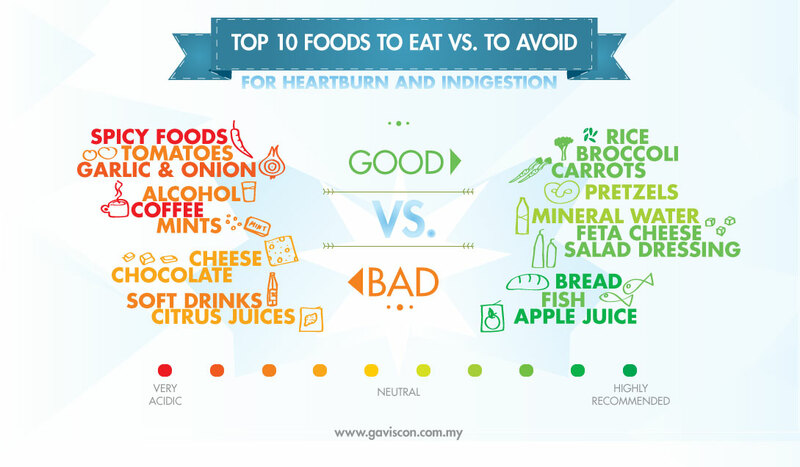 I realize how common indigestion and heartburn problems are, and as such, share below an infographic to help you inculcate a healthier eating habit..